Jack Leiter throws the last pitch in his no-hitter for Delbarton against Don Bosco Prep in the high school baseball playoffs in the North Jersey, Non-Public A tournament Friday in Ramsey, N.J. Photo courtesy of Al Leiter/Twitter. 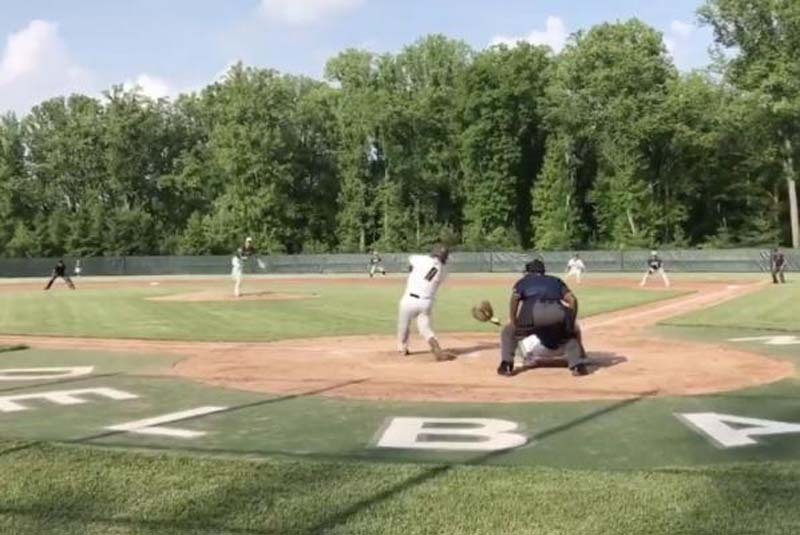 Jack Leiter, the teenage son of former All-Star pitcher Al Leiter, threw a no-hitter for Delbarton against Don Bosco Prep in the high school baseball playoffs. Leiter pitched the no-no in Delbarton's 2-0 win in the semifinal round of the North Jersey, Non-Public A tournament Friday in Ramsey, N.J. The elder Leiter threw the first no-hitter in Miami Marlins history on May 11, 1996. The lefty was a two-time All-Star and won the World Series twice. He led baseball in hits per nine innings in 1996. Leiter, 52, was in the stands on Friday to watch his son. He got the final out after forcing a ground ball to the shortstop, who threw over to first base. Leiter was mobbed on the third base line by his teammates as his dad cheered from the stands behind the plate. Leiter -- a right-handed hurler -- had six strikeouts and walked two batters during the seven inning gem. "I'm so proud of my son Jack!! The last pitch of his no hitter vs. Don Bosco HS in semifinals of the NJ state playoffs 2-0 win," Leiter tweeted. "Seton Hall Prep next. Good luck fellas." Leiter is committed to play at Vanderbilt next season. The elder Leiter made his Major League Baseball debut in 1987 with the New York Yankees. He played 19 seasons for the Yankees, Toronto Blue Jays, New York Mets and the Marlins. Leiter owned a career 3.80 ERA and 162-132 record on the hill. Delbarton battles Seton Hall Prep on Tuesday.